Albinia de la Mare (1932–2001) spent the greater part of her working life as a paleographer investigating the life and work of Bartolomeo Sanvito, a Renaissance scribe who, until 1947, was anonymous. Although she did not identify him—that happy occurrence was the joint work of Augusto Campana and James Wardrop—she became his principal exponent. In the course of thirty years she established a large corpus of his work. Unfortunately, her untimely death in late 2001 at the age of 69 came before she was able to publish a complete summary of her findings. The closest she came was a lengthy essay (in Italian) surveying Sanvito’s work that was included in the catalogue La Miniatura a Padova dal Medioevo al Settecento (1999). Since de la Mare’s death her colleagues, led by Laura Nuvoloni and Anthony Hobson, have been diligently at work sorting through her papers in an attempt to recreate her work on Sanvito. The result of their heroic efforts is Bartolomeo Sanvito: The Life and Work of a Renaissance Scribe, a posthumous magnum opus that combines the English version of de la Mare’s 1999 essay with a chronology of Sanvito’s life based on archival sources by Scott Dickerson, essays on Sanvito as a miniaturist by Ellen Cooper Erdreich and on the bindings of his manuscripts by Anthony Hobson, and an annotated catalogue by Laura Nuvoloni—based heavily on de la Mare’s notes—of every known manuscript with a text written out by Sanvito. De la Mare’s “Bartolomeo Sanvito da Padova, copista e miniatore”, now the “Introduction” to Bartolomeo Sanvito, has not been updated to take into account Dickerson’s discoveries or other research during the past decade. De la Mare divides his life into phases based on paleographical and codicological changes in his work. She identifies 116 manuscripts written out by Sanvito, a number that has grown to 125 in the book’s catalogue—a list that does not include the many manuscripts with frontispieces or incipits by Sanvito. De la Mare had a keen eye for changes in calligraphy and her discussion focuses extensively on a few key letters (h, z, uncialesque T, small R) and distinctive ligatures (ct, sp, and spiraling ho) in both Sanvito’s corsiva and formata. She also takes into account the kinds of punctuation, abbreviations and marginalia he used—Sanvito was a copyist and not simply a calligrapher—as well as his ruling patterns, the color sequences employed in his rubrication, and the authors of the texts he transcribed. Her discussion of his script is accompanied by marginal illustrations of relevant letters, ligatures, punctuation, and sigla at original size—something the original the essay lacked. De la Mare’s discussion of Sanvito’s calligraphy emphasizes his minuscules rather than his more flamboyant colored epigraphic capitals. She is acutely aware of the subtle ways in which he manipulated their color sequence, but she makes few comments about the letters themselves except to point out when they vary in size or are leaning. The minuscules provide her with clues for dating his manuscripts. This is important since Sanvito only signed two manuscripts in full (both at the end of his life) and only initialed seven others (all between 1494 and 1501). Guido Bonatti, Jacopo Questenberg and other scribes copied his style making attributions even more complicated. Unfortunately, their work is not shown so the reader has to trust de la Mare when she corrects previous attributions. If de la Mare had lived longer, she surely would have made adjustments to her paleographical-codicological outline of Sanvito’s life to take into account Scott Dickerson’s documentary researches. His chronology of Sanvito’s life—which does not always match hers—is one of the most valuable aspects of Bartolomeo Sanvito. Dickerson, a legal secretary and amateur calligrapher (he is a member of the Friends of Calligraphy), has been doggedly investigating Paduan archives for nearly two decades looking for evidence of Sanvito to update the early 20th c. work of Silvio de Kunert. He has found a remarkable amount of material that gives us a three-dimensional portrait of Sanvito the man that supplements the existing two-dimensional one of Sanvito the celebrated calligrapher. In Dickerson’s hands he has come alive. What follows is a summary of Sanvito’s life that combines de la Mare’s and Dickerson’s discoveries. Bartolomeo Sanvito was born Bartolamio da San Vio in Padua in 1433—not 1435 as has been previously believed. His father died a decade later. His brother Fantino sketched a portrait that is believed to be of Sanvito at age 18, by which age he had started his career as a scribe copying legal documents for Giacomo da Bassano. He was trained in gothic cursive and his earliest dated italic script is from mid-1454. He may have been a pupil of Francesco Squarcione, a Paduan artist famous as the teacher of Andrea Mantegna. Sanvito’s first known work, a copy of Tibullus to which he added a gathering c.1452/1453, is his only manuscript not to have capitals in alternating colors. This distinctive aspect of his oeuvre ﬁrst appeared in his second work, a copy of Virgil (dated to c.1453/1454) that he wrote out entirely. Sanvito did not invent polychrome capitals—Biagio di Saraceno had used them earlier in a famous copy of Eusebius—but he made them into his personal mark. His early colored capitals were hesitant and stiff imitations of Biagio’s, but sometime between 1457 and 1459 he began to make letters that, because they were written rather than drawn, were fresher and livelier. His assured writing caught the attention of leading Venetian Humanists and Sanvito soon had his ﬁrst patron, Marcantonio Morosini of Venice. Morosini commissioned a combined Tibullus, Catullus and Propertius manuscript from him in 1460 and several other manuscripts in the following seven years. Another patron of his in the early 1460s—the years when his writing matured and became yoked to the new all’antica style of decoration—was Cardinal Francesco Gonzaga. Cardinal Lodovico Trevisan, Patriarch of Aquileia may also have been a patron in those years since he owned at least three Sanvito manuscripts, but they may have been gifts rather than commissions. Sanvito was part of Cardinal Gonzaga’s household from 1463 until the Cardinal’s death in 1483. He moved to Rome in October 1464 and remained there, with frequent trips back to Padua, until 1501. During these decades he was the leading scribe of Humanist texts. Among his clients during these years were Sixtus IV, King Matthias Corvinus of Hungary, Giovanni d’Aragona, Ludovico Agnelli of Mantova, and Bernardo Bembo (whose friendship dated to 1458). On many of these manuscripts he worked with the best miniaturists of the day, especially with Gaspare da Padova, another member of Cardinal Gonzaga’s household who he had met as early as 1462. The two began their collaboration in 1469 with a stunning copy of Julius Caesar and continued until the early 1490s when it is believed Gaspare died. Their masterpiece is the two-volume Greek and Latin Iliad of Homer (1477–1483) that was left unfinished due to the death of Cardinal Gonzaga. The new invention of printing began to have an effect on Sanvito’s livelihood by 1478, but the death of Cardinal Gonzaga dealt him a more serious blow. He was appointed a notary of the Roman curia in the 1480s but his tenure was brief. Agnelli became a patron of his and there is evidence that Sanvito began to make manuscripts “on spec” with the hope of attracting other clients. In 1487 or 1488 he made a copy of the first recension of Fra Giovanni Giocondo’s silloge, an inventory of Roman inscriptions, dedicated to Lorenzo de’ Medici. 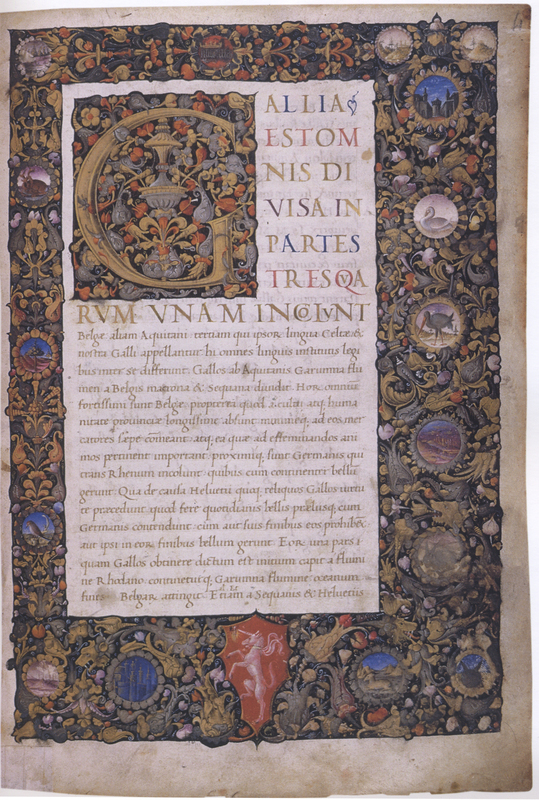 It was the first of several copies of Fra Giocondo’s text that Sanvito made in the waning years of his life, several of which included his own discoveries of ancient inscriptions in the Veneto.In the late 1480s or early 1490s Sanvito executed a series of Books of Hours in which he pioneered a new luxurious style that incorporated dyed parchment and letters in either silver or gold. Unfortunately, the 1480s are also the decade in which there is evidence that he suffered from arthritis. It was through his stint in the curia that Sanvito met Raffaele Riario whose household he served in from c.1491 to 1498, initially as “camerario apostolico” or majordomo, a role that curtailed his scribal output. During the decade he wrote out a number of copies of Cicero, the first of which (dated to December 1494) is considered his earliest pocket-sized manuscript. It was an alternative to printed editions of the text, preceding the famous pocket-books of Aldus. During these years he began initialling and dating some of his manuscripts, one of which, another copy of Cicero dated 14 February 1497, became the key to his identification by Wardrop and Campana in 1947. Perhaps the changes in his writing caused by his increasing arthritis—larger and shakier minuscules, thinner capitals and unbalanced titles—spurred him to sign his manuscripts as proof that they were by the famous Sanvito. After 1498 there is evidence that Sanvito bought and sold antiquities and even the suspicion that he may have forged inscriptions. Sanvito left Rome in 1501 and spent the last decade of his life in his native Padua. In 1507 he was declared canon of SS. Nazario e Celso at Brescia and a year later canon of S. Giustina at Monselice. He continued to write out manuscripts, including a manual for Padua Cathedral (1506–1508) and his last great work, a combined Epistolarium et Evangeliarum (1509), the only manuscript he signed with his full name. In his later years he did the decoration for many of his manuscripts. He spent part of his time in his waning years collecting inscriptions in northeast Italy, adding to Fra Giocondo’s inventory. Around 1506 his texts began to incorporate the modern style of punctuation that Aldus had pioneered with the publication of Bernardo Bembo’s De Aetna (1495). Sanvito died in 1511. Dickerson says that Sanvito was able to write 200 to 300 pages of italic in a small format in seven weeks. Despite this rate of productivity, he suggests that Sanvito did not work as a lone scribe. Instead he was a contractor or broker of manuscripts. This would explain the many manuscripts in which he only did the epigraphic capitals for titles and incipits, lacking the time or ability to do the main texts himself. His colored capitals could have been construed as a sign of authenticity and guarantee of quality. This is a tantalizing notion that suggests the need for detailed information on the manuscripts that he partially did. It may be that the scribes whose styles mimic Sanvito’s were members of a workshop or his colleagues. Ellen Cooper Erdreich’s essay “Bartolomeo Sanvito as Illuminator” tackles a controversial subject since Sanvito’s activities as an illuminator or miniaturist have been debated for decades. The evidence comes principally from a 1466 contract, a 1478 payment note, and his signature on the two manuscripts of 1509. As an illuminator Sanvito is considered to be second-rate, as having more ambition than ability. His compositions are derived from Mantegna and the new Humanist tombs in Florence and Padua. His drawing style is described as “offhand” and hurried—in some ways reflective of his writing style. The most important aspect of Sanvito’s work as a miniaturist is his drawing of initial letters for himself and for others to paint. His rendering of Roman coins, including the lettering, in several manuscripts of Suetonius has garnered praise. Anthony Hobson’s essay on Sanvito as a binder is sketchy—Hobson covered much of the same ground in Humanists and Bookbinders (Cambridge: Cambridge University Press, 1989)—as there are only 18 bindings he provisionally attributes to the scribe, seven each from his early years in Padua and his long sojourn in Rome, and four from his later years in Padua. They are typically Paduan Humanist in style with gilt-tooling. Hobson concludes that Sanvito likely did the bindings but not the gold tooling. Despite the slightness of his essay the fact that it exists at all is a measure of how far Sanvito scholarship has come in the past forty years. The large format of Bartolomeo Sanvito was chosen to accommodate its 275-page catalogue section. Each manuscript, shown in the order established by de la Mare, has its own spread with detailed notes by Laura Nuvoloni on the verso and a same-size reproduction from the manuscript on the recto. This corpus of Sanvito’s work allows scholars for the first time to be able to easily compare a large number of his manuscripts at once without having to travel to fifty-one libraries (and a few private collections) in fourteen countries on two continents. The Appendix contains a chronological list of the sigla used by Sanvito, a list of the principal color sequences for his rubricated capitals (a compilation of manuscripts rubricated by him is badly needed), a chronology of his use of catchwords, signatures and ruling patterns (with useful illustrations), and a summary of Sanvito attributions rejected by de la Mare. The list of rejected attributions will help to untangle some of the conflicting claims involving Sanvito that have accumulated over the last fifty years. The design of the book by Humphrey Stone (son of the engraver and stonecutter Reynolds Stone) is generally exemplary. The large amount of scholarly apparatus (notes, references, captions and a lengthy bibliography) has been handled very well. The text, set throughout in Robert Slimbach’s Minion, is easy to read and legible at small sizes. Inevitably, there are typographical errors, but the only instance where they are jarring is in the Sigla section of the Appendix where every en-dash is mysteriously replaced with a tilde-accented capital N. Unfortunately, the reproductions are erratic in quality with several being “soft”, suggesting that they were scanned from slides. Bartolomeo Sanvito. is a large, heavy and expensive book. It is that rarity, a scholarly work that is also a visual delight. Essential for Renaissance paleographers and art historians, it is an indulgence for calligraphers and those enamored of Sanvito’s polychrome capitals. Whichever camp you are in, be glad that Anthony Hobson, Laura Nuvoloni and their colleagues have brought it to fruition.